It was already 10pm, and I still don’t know our itinerary. The flight was at 9am the following day and while I have packed already, I still need to make sure I have everything I would need for the activities they have in store for us. As 11 o’clock roll by, our itinerary finally comes via e-mail. Within seconds after opening the document, my annoyance melted away: we were having dinner at Zubuchon and island hopping with Islands Banca! Inside Zubuchon. This restaurant is just too pretty. While Cebuanos might argue that Zubuchon isn’t really the authentic Cebu Lechon, I was still quite excited to try the restaurant. Being an avid Market Manila reader, I’m really excited to try the dishes Market Man has been writing about. This isn’t the first time I encountered Zubuchon, actually. 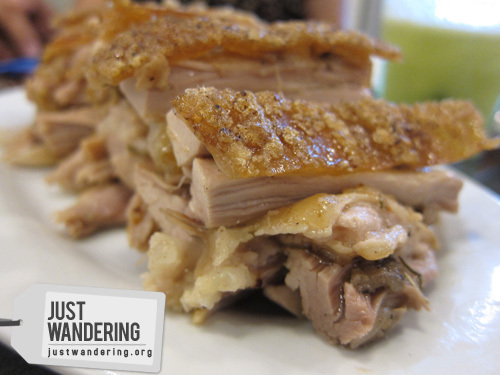 We were able to try it back in 2009 when they were still selling freshly chopped lechon at the Banilad town center. In 2010, fresh and frozen Zubuchon was available at the domestic pre-departure lounge of the Mactan-Cebu International airport, so I was able to buy it again during a quick trip to Cebu. Market Man finally took the plunge and opened the first Zubuchon restaurant in Cebu earlier this year at Mango Square. We were welcomed to the restaurant by Joan Danao, Zubuchon’s General Manager. As we settled into our table (after taking a hundred photos of the restaurant and the lechon), we perused the menu and was quickly overwhelmed with the choices: everything is made with lechon! 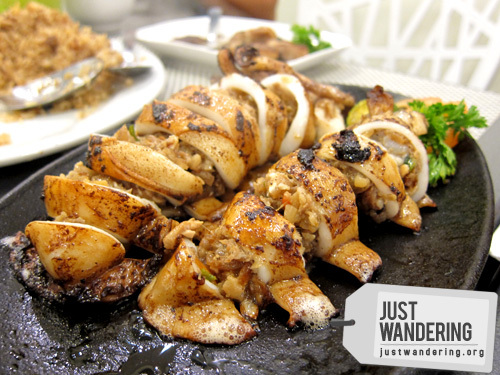 Sinigang na lechon, lechon sisig, mongo with lechon… where do you start? Joan fired off a list of dishes she wanted us to try and soon enough, our table was practically groaning with the amount of food our little party of six. I wouldn’t go too much into detail about the food, except that it does tastes as good as Market Man describes it. When you do get a chance to eat at Zubuchon (whether in their Mango or Escario branch), do try their home made chicharon, squid stuffed with lechon sisig and the Zubuliempo. Despite not being a fan of kamias, I thoroughly enjoyed their iba shake, which also serves as a great palate cleanser. 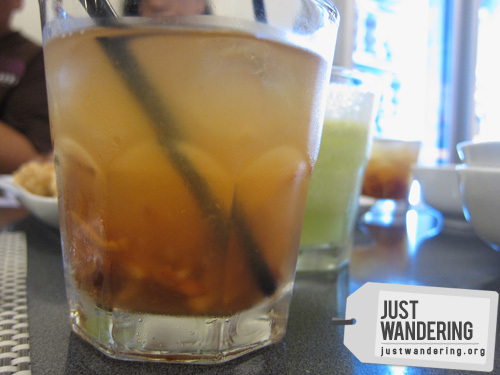 If you’re a santol lover like me, be sure to order the santol juice. It’s simply amazing. 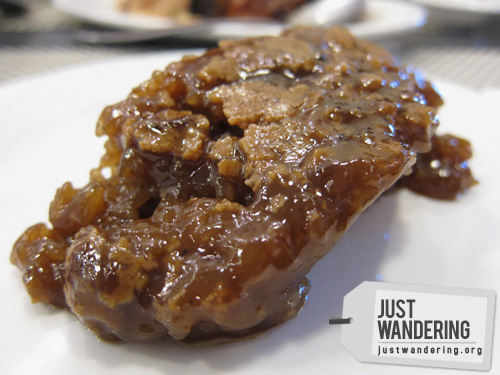 For dessert, you can try Joan’s leche flan, which is very light and not too sweet. If you have more space in your stomach, also try the biko, which they source from a seller who’s been making it for decades. Prices range between Php 150 to Php 400 and serving sizes are good for 2 to 3 people. It’s not the cheapest restaurant to dine in, but it’s a pretty good value for money. 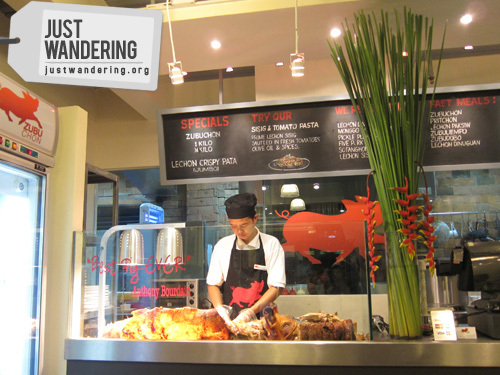 It’s definitely a good place to try lechon and other Filipino dishes. Following our lechon-laden dinner, we headed to Mactan island for our island hopping tour with Islands Banca. This is my first time to island hop in Cebu and I have to admit I was more than intrigued with Islands Banca. I’ve seen their website last year and thought it was frivolous; island hopping can be done with regular outrigger boats at half the cost, so why shell out more money? I got my answer when I saw the Butanding. 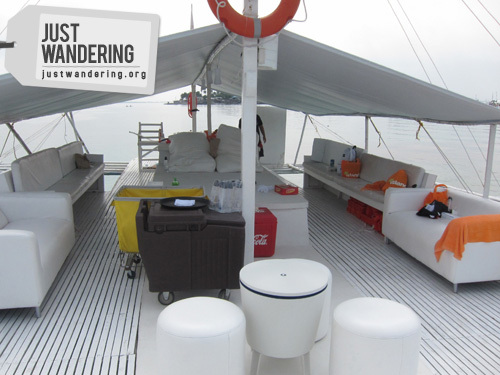 Named after the gentle whale shark, Island Banca’s biggest boat can accommodate up to 30 passengers and features padded benches, cushioned lounge chairs, comfortable couches and inviting beanbags. There’s even an iPod dock, Wi-fi and a toilet. It’s basically a chill out lounge on water. Islands Banca’s services goes beyond providing you with a banca. It’s manned by trained crew who will attend to your needs and even prepare a picnic for you if you so choose. 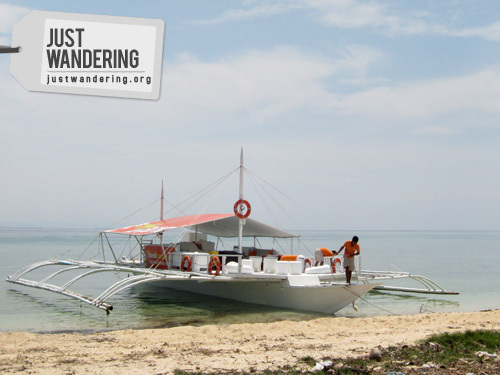 Since we had limited time, we only made two stops: to the Gilutungan Marine Sanctuary to snorkel (they have a snorkels on board) and to Pandanon Island in Bohol. At the risk of sounding shallow, the tour was made better by bean bags. I’ve been to a number of island hopping trips and in all of them, I ended up nodding off and waking up every 5 minutes because sleeping sitting up in a moving outrigger boat is really not the most comfortable thing in the world. Lying on my beanbag towards the bow of the boat, sea breeze keeping me cool while the sun shines brightly overhead, and the gentle rocking of the boat as it cuts through the water, I was in my most relaxed state in months. If you have limited time in Cebu and can’t take an island hopping tour, you might want to try their Chill-out Cruise, which takes you across the Mactan channel at sunset. 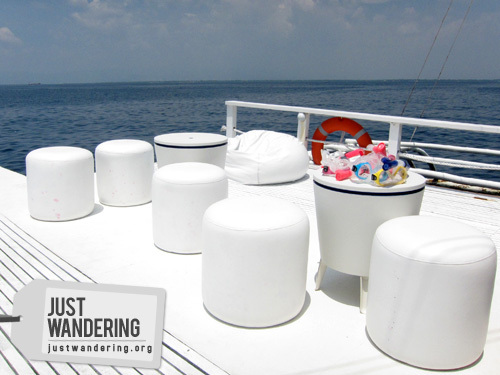 The 90-minute cruise departs at 5:30pm from the Cebu Yatch Club and costs Php 295 per person (inclusive of one drink). It’s so good Kate! Very different from biko we’re used to! i want to try that biko too! and also the leche flan! 295 for a short cruise? Really? Okay ha, I want to try that. The actual island hopping thing sounds great too, kaso it looks like something which will be better if you’re in a big group. Haaay, must plan a Cebu trip in the near future. Haven’t been there in ages. Let’s go Kaoooo! I want to eat at Zubuchon again! Lechooon! Eh bat ba ako nag click sa site ng gabi ayan tuloy nagugutom ako haha!! Yesss! Reasonable na di ba? Saka, di ba bawal ang lechon sa diet mo? 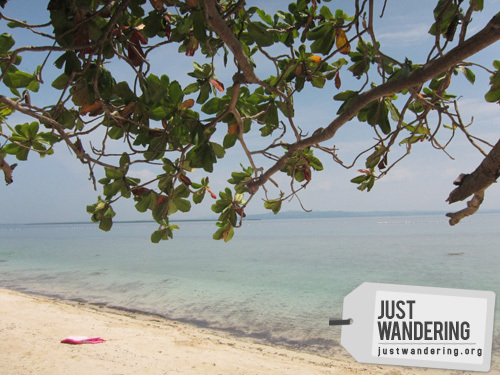 ang sushal na island hopping, pero afford! teh, konti nalang papayag na ang dyanie sa nov. happiness! hi can i have the exact address of the zubuchon restaurant will go to cebu by next month and i won’t miss the chance to dine at zubuchon..
ma’am ba’t wala po kayong entry about northern luzon? 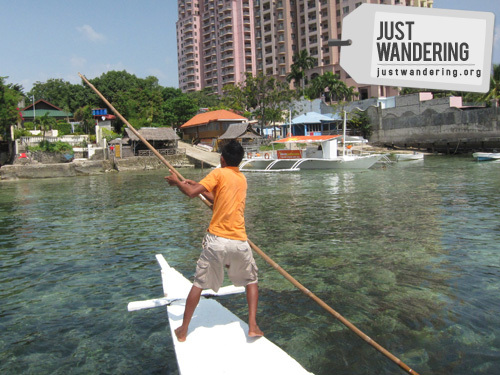 Have you looked at my Lakbay Norte posts?